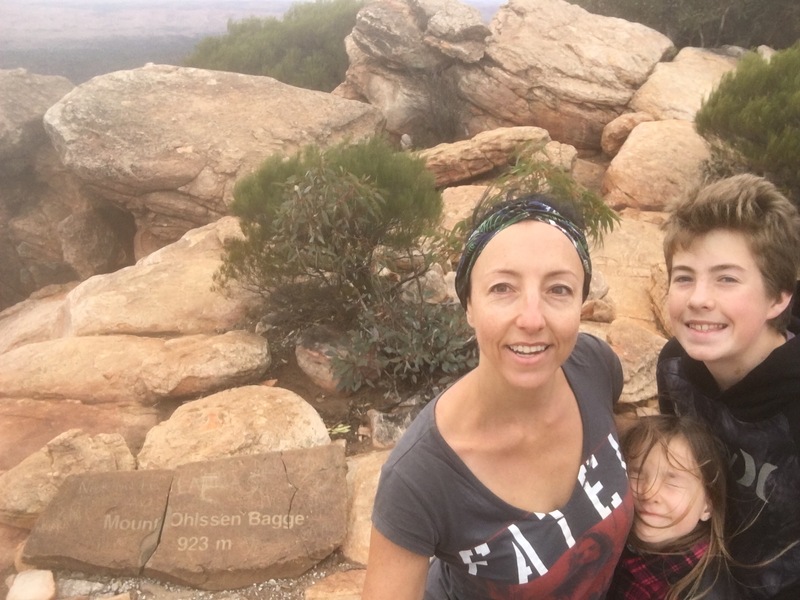 We swapped the grey nomads for the Flinders Ranges and ended up camping next to a family of four kids at Wilpena Pound. They were doing a similar trip to us except they only survived with the camper fridge for all six of them and home schooling was something they did in real life too. Me? I’ve packed enough food in the fridge and second freezer to go AWOL for months and the idea of permanent home schooling makes going AWOL (solo) very tempting! 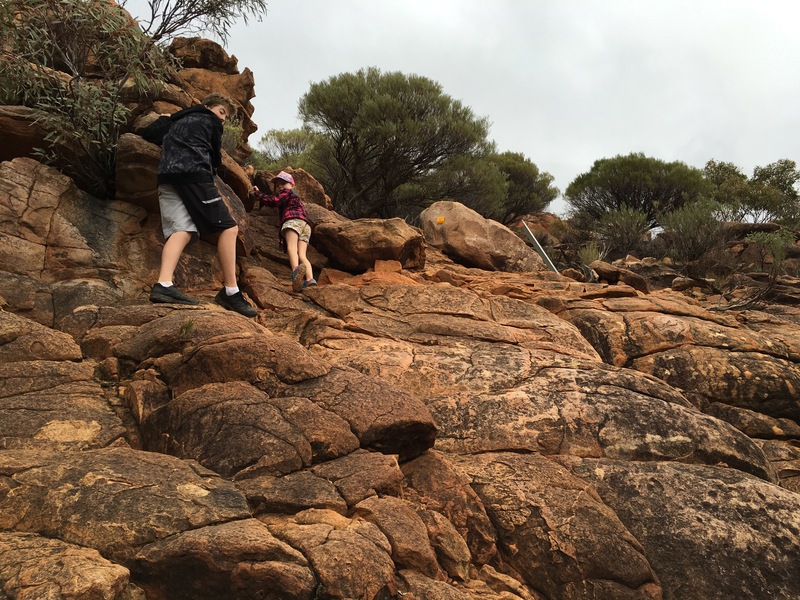 We decided to have a crack at a mountain hike, the weather was a cooler 22 degrees with a few spits here and there – how hard could a 7km hike be? I read the promo brochure and decided we’d go straight to the ‘difficult’ hike and follow the advice of packing some supplies into a backpack and giving Pa a quick call to let him know we should be back in four hours. He was on his way to the footy so I figured he’d remember us once the game was over and he’d gone home, if anything went wrong he’d figure something out. They weren’t lying when they said ‘difficult’ the terrain was very rocky and often times vertical – these bits were OK, it was more the yellow reflectors stuck to rocks as ‘guides’ to mark the ‘path’ that we had to think about! All in all, it took us nearly five hours as we added the long way back to the end of the hike. 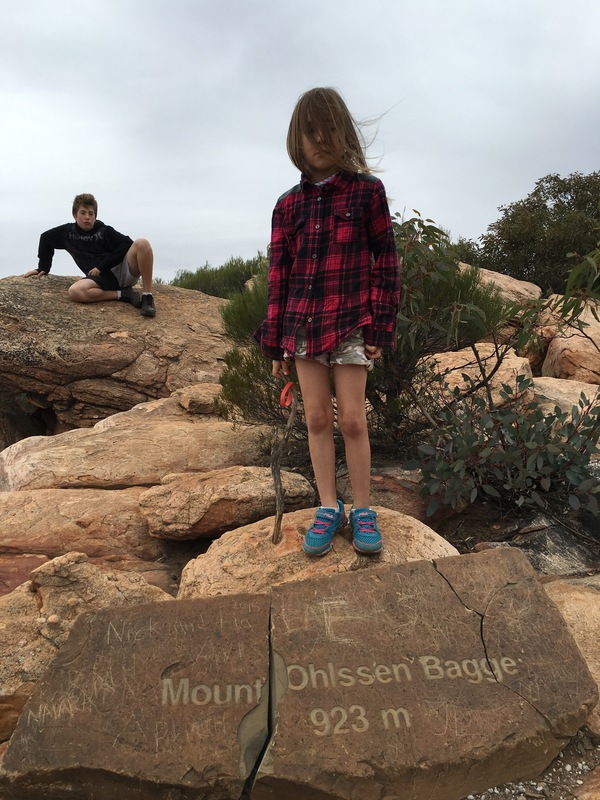 I was incredibly proud of the kids – Master 14 looked out for his little sister and Miss6 channeled her Dora the Explorer experience and raced up the mountain, exploring and having a great time. Back to camp after some yodelling down the mountain (Sound of Music style after we’d seen a mountain goat high on a hill… – my life story could be told in song lyrics and movie lines!). We were pretty impressed with our efforts and all a little knackered so decided not to pack up the following day to leave (it was Mother’s Day and I gave myself the day off) so booked an extra night, built a fire, enjoyed a cold beer, toasted some marshmallows and baked our first campfire scones just before it started to rain at bedtime. Did I say rain? I’m no expert at religion but it bloody poured non stop for 24 hours – between rescuing our water logged awning and outdoor furniture, our campsite started to resemble my idea of Noah’s Ark! Minus the animals (much to Miss6’s disappointment- they’d had the sense to magically disappear when the rain came), if I could’ve got our stabiliser legs up we would’ve floated away. I was grateful the rain stopped in time for me to dry off and wipe down what I could with nappy wipes and a beach towel, before heading to a Mother’s Day dinner at the restaurant that included a complimentary wine. Boy did that go down well! Hopped into bed in our water logged Jayco Ark, electric blankets on, set for a toasty nights’ sleep. Bang!! I woke at 2am with a start – it seems the rain may have stopped but now we were on the tumble-dry cycle with the wind going gangbusters. I went outside, took the awning poles down and tied down the bed end fly’s then back to bed. I thought beds were supposed to be for sleeping – not this night – all I did was lie there trying to identify the noises and whether anything (else) was getting broken by the wind! It’s a miracle! Nothing got broken by the wind (that wasn’t already broken anyway!). We packed up in pretty good time compared to our first few attempts… Until I got to those damned stabiliser legs – even though we’d sorted out where we were going wrong, they needed repairs and weren’t going to wind up. I got a free blow wave, wash and second tumble dry from Mother Nature while I took two of the legs off but eventually we got going and were only half an hour late for check out. The rain had closed some of the roads we’d hoped to travel so I plan to head to Port Augusta to get some repairs before we head off and start our journey north. Hopefully without the rain, though Uluru has water and the NT is seeing its wettest April/May in 21 years – I could very well be the rain goddess here to break the drought! I know the rain can be a pain, but to see the NT in the wet would be awesome. It was so, so dry when we were there last July. I felt for the farmers and their cattle along with the wildlife. Sounds like a great adventure.